Thank you so much to the many of you who provided responses regarding the Real Estate investing mastermind survey last week. This was a huge help in being able to “get inside your minds” (I know…for some of you that is a scary thought, right? haha) and see where I might be able to help you. that there is a large group of folks who are not familiar with mastermind groups. this can’t be taken for granted. that my pricing model needs to be adjusted. 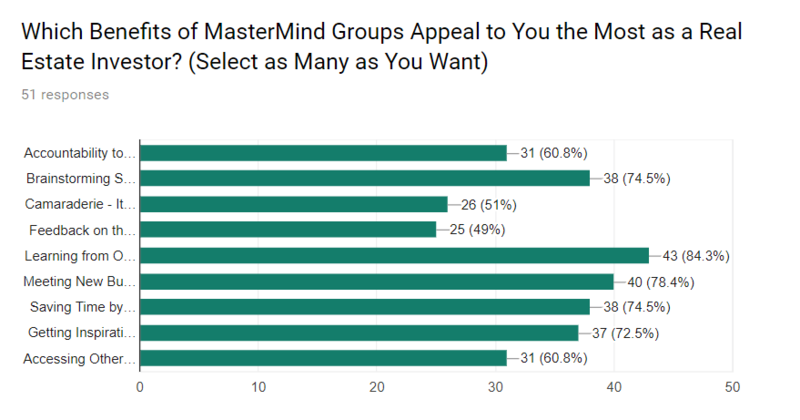 between 1/4 and 1/3 of the responses were not familiar with what a mastermind group was. 4/10 were familiar, and wanted to learn more. 1/10 are currently a member of one (chances are pretty good, most, if not all of those folks are already in my Greensburg based mastermind)…that’s awesome! last but not least, most folks are interested in attending/joining one, but not interested in starting groups. This was an interesting question for sure. What I hoped to find was whether the folks who didn’t know about mastermind groups, were beginners or more experienced. That was more able to be examined by looking at individual responses. If the folks did not put their names/emails (which was completely optional), it still shows Respondent #8 answered this way…and it can help me to identify different patterns. We have a lot of “movers and shakers” & Deal Doers on my list. That’s fantastic! I think it has a lot to do with there being a large number of cash buyers and investors who have purchased deals from me in the past. One out of 4 of you have done over 10 deals. That is fantastic! It was fairly well spaced out. Only 15% of respondents haven’t bought a piece of investment property yet. Again, I think that is great! The purpose of this question was that of: Which benefit(s) are the most important to real estate investors as they think about “real estate investing mastermind groups”. That was completely the focus of this question. Why is this important? Because if I’m going to put together an offer and try to speak to real estate investors about how mastermind groups could benefit them, then it’s important to know what YOU may consider beneficial and important. This is a great piece of advice for any business we are running. People really want to discover…how you can help them, and why is that important. THAT, is question I want to be able to answer for you here. Transparency. I am a huge believer in transparency. With that being said, I was originally thinking my offering needed to be $197/month in order to be worth my time investment into these groups. This has caused me to relook at things. Half the people would only join a mastermind group if it is free. The other half think $97/month sounds fair. reassess my mastermind strategy and what the offer can entail. At this point, I’m probably going to be changing my offering and strategy to bring it more into alignment with what you guys need and want, and want I’m able to provide time-wise right now. Before moving on, let’s talk about free mastermind groups. I get wanting to be a part of a group for free. After all, we are real estate investors, and if we can get discounts, freebies, and not have to pay for things, we are generally, Lovin-it! However, it’s different for mastermind groups. Actually, think of weight watchers. Weight watchers is sort of like a “Mega Mastermind” group. They get over 12 people to show up to meetings, talk about what is working and not working, offer encouragement, and help each other hit their goals. Right now, to join Weight Watchers requires an investment of anywhere from $20-$50/month, depending upon whether you only do online, or if you do Live meetings. Why do they have to pay? If they truly care about helping as many people as possible, why charge anything? Because people need to have skin in the game. You need to invest in yourself. You need to BET on yourself, that you are going to show up, do things, take actions, and move mountains to hit your goals and dreams. That’s why, free real estate investing masterminds aren’t an option for me. I believe the attendees will hold themselves more accountable, actually show up to meetings, and be more “givers” to the rest of the group, than if they were freebie attenders. Make sense? So, by offering a mastermind group for free, you would actually be hurting the group due to lack of attendance, not as much giving, and not being as committed to the group or your dreams. Well, I’m hoping to have the new virtual Mastermind Group offering finished up this week. I’m actually a member of a mastermind group right now. The goal of that group, is to help people learn to better lead Mastermind groups and it is over $350 per month. I’m hoping to get some clarity from my group today about how to better structure an offer for you guys and help put together an effective virtual mastermind group that helps you guys achieve your goals and dreams. In the meantime, over the next week or so, I’m going to put together a couple new blog posts discussing mastermind groups, and how they could benefit you as a real estate investor. If you already think that joining a mastermind group is something you’d like to do, I would love to speak with you for 15 minutes to make sure it’s a fit and see where you may work well. Please contact me and we can go from there. Real Estate Investor / Mastermind Leader, Stroke Survivor, Family Man, Triathlete.